Encouraging the production and sale of the world’s most energy-efficient products. 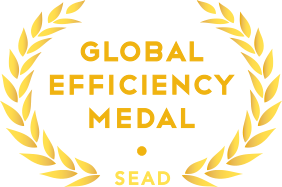 SEAD’s Global Efficiency Medal competition encourages the production and sale of super-efficient equipment, appliances, and electronics by recognizing the world’s most energy-efficient products. Since 2012, the Global Efficiency Medal has served as a high-level forum to showcase manufacturers’ ability to meet consumer demand for feature-rich, energy-efficient products that provide top-quality services while reducing energy costs. The awards competitions demonstrate the levels of efficiency that are possible today, and shine a spotlight on innovative new technologies that can further push the boundaries of efficiency and slash energy consumption.